(Inland Empire)– Let me start off by saying I have not picked up a Predator comic in quite sometime and was a little apprehensive for fear that I may be lost in the storyline. 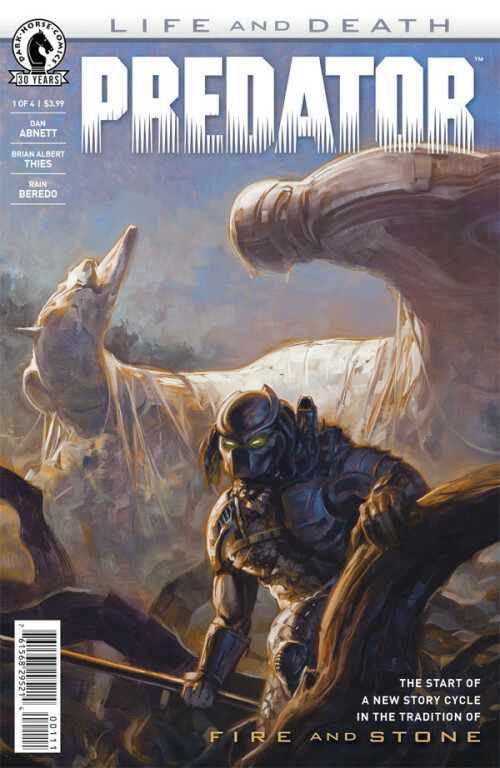 The storied film franchise has also been a mainstay at Dark Horse Comics for some time now, and with this new limited series, we see the worlds of the Predator, Aliens and Prometheus begin to collide. My fears were short-lived as this is a new tale, which takes place approximately 43 years or so after the first Aliens film. The first few pages introduced the reader to the new characters and set the stage for what’s to come. The action picks up immediately after in gory, Predator fashion. It’s interesting that the first half of the book reads more like an Aliens story and is an enjoyable segue to the Predator storyline. Avid readers/fans of these universes will appreciate the subtle references to the Alien and Prometheus films. Dan Abnett’s character dialogue captured humorous moments, which progressed later in the story to a sense of dread, which he conveyed very well. Brian Albert Thies’ artwork seemed to fit the mood of the story with solid characterization and nice action sequences. All in all the Predator Life and Death #1 is worth a read and sets nice groundwork for the issues to follow.